Earth's ozone layer appears to be on the road to recovery. May 26, 2006: Think of the ozone layer as Earth's sunglasses, protecting life on the surface from the harmful glare of the sun's strongest ultraviolet rays, which can cause skin cancer and other maladies. People were understandably alarmed, then, in the 1980s when scientists noticed that manmade chemicals in the atmosphere were destroying this layer. Governments quickly enacted an international treaty, called the Montreal Protocol, to ban ozone-destroying gases such as CFCs then found in aerosol cans and air conditioners. 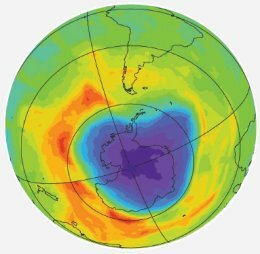 Today, almost 20 years later, reports continue of large ozone holes opening over Antarctica, allowing dangerous UV rays through to Earth's surface. Indeed, the 2005 ozone hole was one of the biggest ever, spanning 24 million sq km in area, nearly the size of North America. Listening to this news, you might suppose that little progress has been made. You'd be wrong. While the ozone hole over Antarctica continues to open wide, the ozone layer around the rest of the planet seems to be on the mend. For the last 9 years, worldwide ozone has remained roughly constant, halting the decline first noticed in the 1980s. The question is why? Is the Montreal Protocol responsible? Or is some other process at work? It's a complicated question. CFCs are not the only things that can influence the ozone layer; sunspots, volcanoes and weather also play a role. Ultraviolet rays from sunspots boost the ozone layer, while sulfurous gases emitted by some volcanoes can weaken it. Cold air in the stratosphere can either weaken or boost the ozone layer, depending on altitude and latitude. These processes and others are laid out in a review just published in the May 4th issue of Nature: "The search for signs of recovery of the ozone layer" by Elizabeth Weatherhead and Signe Andersen. Sorting out cause and effect is difficult, but a group of NASA and university researchers may have made some headway. Their new study, entitled "Attribution of recovery in lower-stratospheric ozone," was just accepted for publication in the Journal of Geophysical Research. It concludes that about half of the recent trend is due to CFC reductions. Lead author Eun-Su Yang of the Georgia Institute of Technology explains: "We measured ozone concentrations at different altitudes using satellites, balloons and instruments on the ground. Then we compared our measurements with computer predictions of ozone recovery, [calculated from real, measured reductions in CFCs]." Their calculations took into account the known behavior of the sunspot cycle (which peaked in 2001), seasonal changes in the ozone layer, and Quasi-Biennial Oscillations, a type of stratospheric wind pattern known to affect ozone. What they found is both good news and a puzzle. 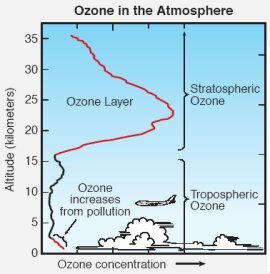 The good news: In the upper stratosphere (above roughly 18 km), ozone recovery can be explained almost entirely by CFC reductions. "Up there, the Montreal Protocol seems to be working," says co-author Mike Newchurch of the Global Hydrology and Climate Center in Huntsville, Alabama. The puzzle: In the lower stratosphere (between 10 and 18 km) ozone has recovered even better than changes in CFCs alone would predict. Something else must be affecting the trend at these lower altitudes. The "something else" could be atmospheric wind patterns. "Winds carry ozone from the equator where it is made to higher latitudes where it is destroyed. Changing wind patterns affect the balance of ozone and could be boosting the recovery below 18 km," says Newchurch. This explanation seems to offer the best fit to the computer model of Yang et al. The jury is still out, however; other sources of natural or manmade variability may yet prove to be the cause of the lower-stratosphere's bonus ozone. Whatever the explanation, if the trend continues, the global ozone layer should be restored to 1980 levels sometime between 2030 and 2070. By then even the Antarctic ozone hole might close--for good. Attribution of recovery in lower-stratospheric ozone by Eun-Su Yang and Derek M. Cunnold (Georgia Institute of Technology), Ross J. Salawitch (NASA/JPL), M. Patrick McCormick and James Russell III (Hampton University), Joseph M. Zawodny (NASA/Langley), Samuel Oltmans (NOAA) and Michael J. Newchurch (University of Alabama and the Global Hydrology and Climate Center), Journal of Geophysical Research, accepted for publication, March 22, 2006, in press. Key to the new science in Yang et al's paper was their ability to measure ozone at different altitudes in the stratosphere. They did this using balloons and three NASA satellite sensors: SAGE, SAGE II and HALOE.